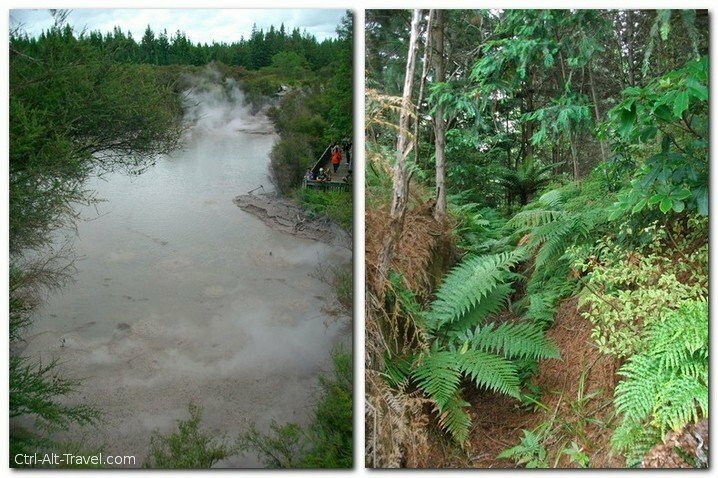 New Zealand in general is a hotbed of geothermic activity. Earthquakes and volcanoes, you name it. 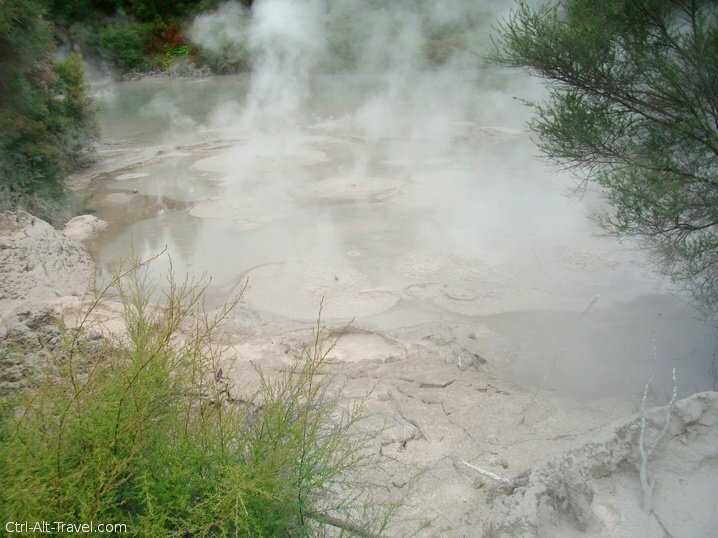 Rotorua, in the north island, is a center for a lot of the “cool” stuff. Stuff like oozing holes in the ground or smoking pits, you know, the entertaining aspects of this geothermal stuff. So this kind thing needed to be on the “to see” list for the area. 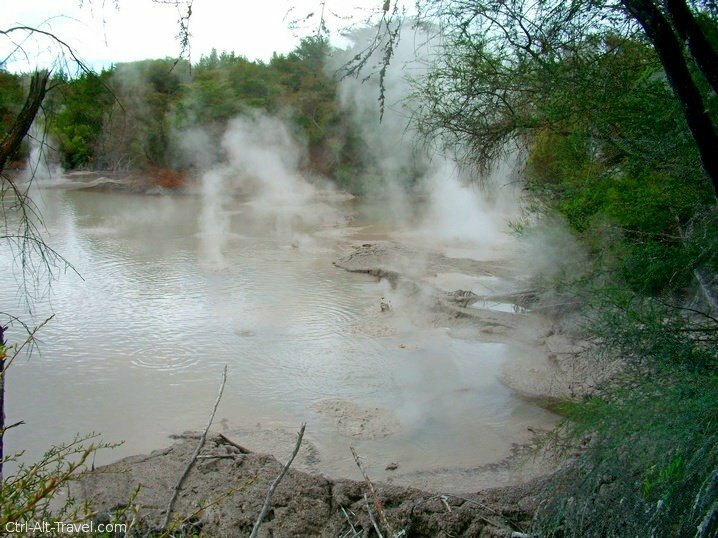 We booked a van tour out from Rotorua to Wai-O-Tapu area which included a stop at the mud pool. 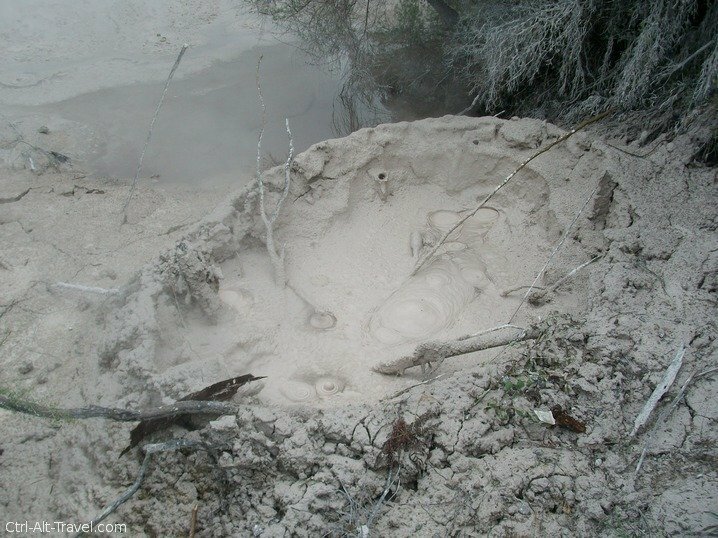 There was once a mud volcano that apparently subsided in the 1920s, so is no longer as volcano-like, but more of a steaming hot pool of mud. The center of the pool was mostly steamy and not so easy to watch, but around the edges the sputtering mud was much closer to the walkways. The idea being that the heat from the ground comes up in this one spot and heats the pool to near boiling. The mud bubbles up and spits and sputters. It is kind of hypnotic to watch. This is definitely on the tourist trail. We were one van of several plus a bus. This was at best a turn-off of the beaten track. I got the sense that I saw the same set of people in the park itself down the road and at the morning geyser show, so there are probably times when the mud pool is completely empty and times when it is nearly full. This was not my favorite of the region’s sites. More of a side point. Even still I enjoyed the time here. We got to get really close to this thing that is essentially a powerful force of nature. Oh and it reminded me of zones in video games. We got maybe 20 minutes total to wander along the railed walkways that extended around one side of the lake. Then it started to rain and we were quite happy to scurry back to the van .